ez4473.com is a alternative way of filling out e4473 form. ez4473.com does not download anything to your computer. You can click the sign up now tab or call 702-364-9022. Help eliminate the possibility of clerical errors and sales to undeserving individuals.n Which would result in the revocation of your FFL and the closure of your business. 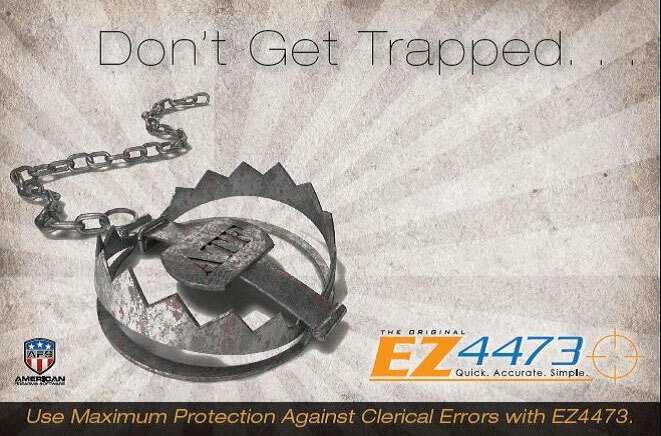 EZ4473 helps to ELIMINATE the possibility of clerical errors and sales to undeserving individuals. Which would result in the revocation of your FFL and the closure of your business. our company's popularity has risen by 90%. I have been a member to this sight for about 3 months now. It was rocky at first getting my people use to the website, but now everyone flies through it no problem. It is great cause now instead of sitting in front of the customer my employees are doing other things in the store that they need to handle. I almost throw in the towel, but now I am very happy I did not.